TEAM PLAYER. 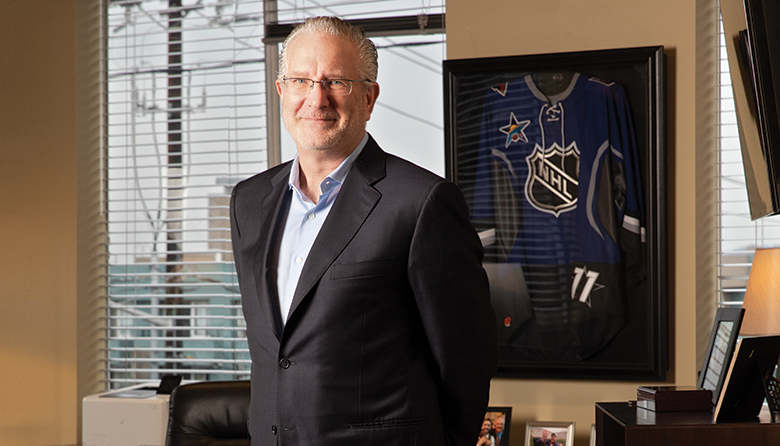 Seattle Hockey Partners CEO Tod Leiweke has been associated with a host of sports organiztions over the past four decades, including the Golden State Warriors, Houston Rockets, Tampa Bay Lightning, Seattle Seahawks, Seattle Sounders FC and now Seattle’s startup National Hockey League franchise. My mother died of cancer when I was 9. At a relatively young age, my dad was a widower with six kids. He remarried. My stepmother was an absolutely remarkable woman. Tragically, she was diagnosed with cancer. So, my dad lost two wives. And I lost a mother and a stepmother before I was 18. It had a real impact on my life. I’ve tried to think about that every day. If I don’t, shame on me. Because she believed in me and knew my life could be full. I moved from Missouri to Colorado after high school. I thought I would establish residency and go to college, but I ended up getting a job at the Keystone Resort. All of a sudden, I looked up and I was 21 and hadn’t gone to college. But doors had opened that I didn’t anticipate. Eventually, I went to work with my brothers [Tracey and Tim], who were starting a professional indoor soccer team in Kansas City. That was the beginning of my sports career. My first big break was with the Golden State Warriors. I started out as VP of marketing and became president of their arena-development company. I learned most of what I know today during that period working for a fantastic owner [Jim Fitzgerald]. The chance to be No. 2 at the NFL was very exciting. I was really enjoying what I was learning there. With the Seahawks and Sounders, I learned a lot about having fans be the centerpiece of what you’re doing. I really learned the art form of it here, and I felt these fans were the greatest I’d ever worked for. So, it doesn’t feel like another stop in a career. It feels like I’ve come home. There were some misgivings when I left Seattle for Tampa Bay. The threshold question was could hockey exist in that community. It took an enormous effort to turn that organization around. I think teams provide enormous benefits to communities — well beyond economics. There are 32,000 [ticket] depositors here who I think about every day of my life. I look at my wife and she sees the loving look in my eyes and she knows that — sometimes — I’m actually thinking about fans, not her. Fans are the reason this enterprise exists. I do love the Northwest. I love the rugged nature of this place. And I love its pioneering spirit. I think there are citizens here who are truly remarkable, and I had a chance to work for one in Paul Allen. If not for Paul, we probably wouldn’t have an NFL team. Not only would you have had to get the team back, you would have had to build a new stadium, and that’s not for the faint of heart. Not only did Paul build that stadium, but he saved the Seahawks, then created the Sounders, which created enormous community goodwill. I’m absolutely thrilled that Jody Allen is having a chance now to run the Seahawks, because she didn’t always get the credit she deserved. She had as much to do with building the stadium as any single person. And it’s right for so many reasons. The Seahawks’ best days might very well be in front of them. Servant leadership is when you don’t put yourself at the top of the organization. You’re actually here to serve everyone else. It dictates certain behaviors and a certain management style. You’ve got to be moral in how you lead. You’ve got to be inspired. So, the people here don’t work for me. I really feel as though in many ways I work for them. We conceded the NHL was right [to delay the expansion of the league until 2021]. We’re going to take every day that we’ve now been given and make the absolute most out of it. We’re going to better serve our fans because we had a little more time. I’m so proud of what we’re doing here. This [arena-redevelopment project] is not the renovation of a building. It’s a completely new building with the same roof. Everything will be new under that roof. The building is costing more than we wanted, but these are all rites of passage to get to the other side of having something great. This town is on fire right now. I know there’s some inconvenience coming, but I think history is going to show this is one of the great eras in this town’s history.